1.1 Hi guys! 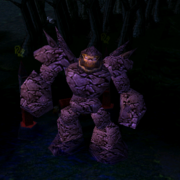 I'm Nova, and I'm currently a moderator here on the Dota-Allstars Forums. I moderate General Discussion, but I also try to take an active part in Mechanics. Months earlier I noticed there wasn't really a guide on Experience, and I decided to make one. After months and months of procrastination, I finally decided to make one...and here it is! Finally, thanks for waiting =). Anyways I know this guide is pretty incomplete, but I will continue to update it and what not. If you have any questions please feel free to ask them here, and I will do my best to answer them in the second post of this thread. 1.2 What is Experience and why is it so important? Experience is an extremely important part of the game. It's the sole thing that levels up heroes and makes them stronger and unlocks new skill points to use. There are many ways to gain experience, the following are all of them. 2. Killing Neutral Creeps (Roshan Included). 3. Killing Towers and Enemy Buildings. 5. Killing Enemy Heroes' Summoned Units. 7. Getting Creep Denied by an Enemy. 1.3 Anyways some key things about experience. 1. Experience is given in a 1000 AoE from the unit that was killed. 4. Using the Bloodstone Item will give you experience in the area in which you died until you revive. 5. Chen's dominated creeps will give regular Neutral Creep values, but if those creeps are Enchanted or Dominated via HoD, then their experience values will decrease (I'll add in the charts later). 6. Techie's Wards/Mines and Pugna's Wards do not give Experience. Observer Wards and Sentry Wards do not either. 1.4 Now I'm sure you guys should have some idea of what "denying" is. If not I'll explain it to you with regards to experience. Denying refers to when you kill your own creep or building, to deny the enemy of getting experience as well as gold. Why is this important? Because if you constantly deny your enemy of experience, you'll end up at a higher level then them and you'll probably have more gold as well. As we all should know, outleveling a hero in your lane is definitely a good thing. Now on to the actual mechanics of "denying." 3. All denies grant the same amount of experience, but it varies if you're a melee hero or a ranged hero. 4. 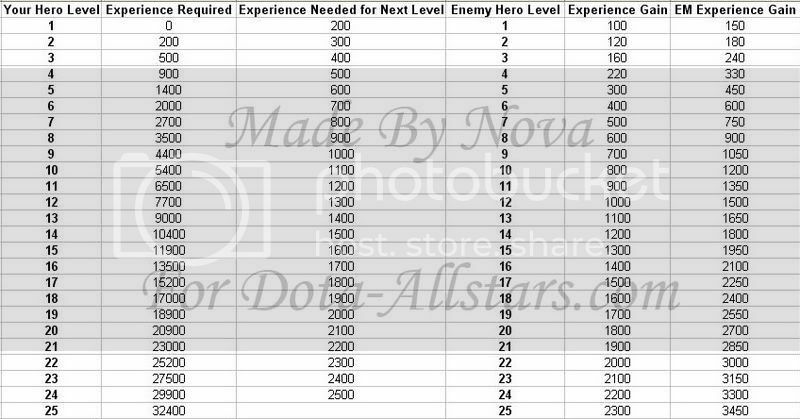 A denied unit grants 36/n experience for melee heroes and 18/n for ranged heroes, where n is the number of heroes within a 1000 AoE. 5. Other methods of denying such as Death Pact, Dark Ritual and Conversion will not grant experience to the enemy at all. 1.5 Now on to actual numbers. The following is pretty much the basic numbers to experience. What experience do you gain levels at, the amount of experience in between levels you need to level up, the amount of experience you gain for killing a level X hero etc. 1.6 Now these are the experience values for the regular creeps that go in the lanes that try to push down the throne. 1.7 Now, these values are for the neutral creeps that can be found as green dots on the mini-map. You can also find these creeps in the forest areas on the map. 1.8 Now these creeps are "special" creeps. 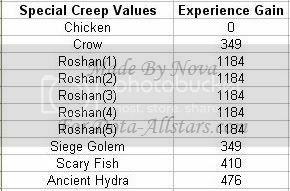 Roshan, Chicken/Crow, and Super Creeps are included. 1.9 These creeps are "summoned" creeps which refer to creeps summoned by items or hero skills. Blaow, Akuryou and Foxnewsnetwork all helped me test as well. Version 1.1 : April 7th, 2007. Updated the format and added section about denies. Version 1.2 : April 7th, 2007. Made my pictures look nicer and added in watermark or w/e. Added EM experience for heroes, as well as Information about creeps after raxes go down. Also added in complete roshan values. where did you find the scary fish?